Little has been written about the house-painting trade from an historical perspective. Whilst only an initial survey, this essay sets out to look at the way the trade was carried out in London between the years of the Restoration and the mid-nineteenth century. The aim is to consider the house-painter as a person; to look at his background and training; the organisation of the trade; his place in the building industry, and in society; and the conditions he worked in. Many of the larger towns and cities would have had their own Guilds, partly commercial and partly social, which would have regulated the conditions of their trade and afforded their members some degree of mutual protection and support. House-painting, with regards to maintenance, would have been carried out by property owners on an ad-hoc basis from the earliest days. However, for the purposes of decoration, it is more likely that it would have been undertaken by a professional. In the larger cities, craftsmen carrying out both decorative and necessary painting tended to form themselves into fraternities or Guilds. 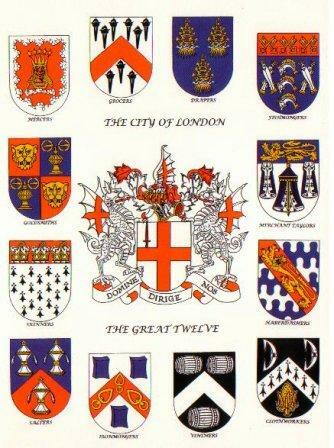 In the City of London, these Guilds had been exercising more or less effective control over their trade since the Tudor period. Their rules and traditions restricted entry to those who had served as an apprentice to a Guild member, and who had proved themselves to be competent workmen. The concept of serving an apprenticeship was inextricably linked with joining a Guild, and therefore practising the trade in the City of London. 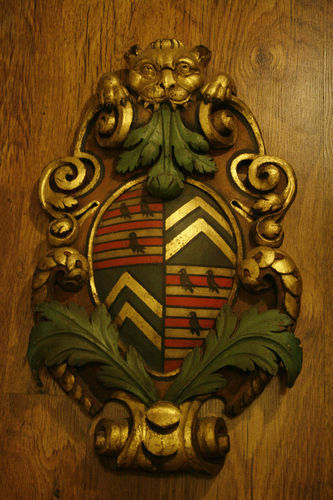 Membership of a Guild, or Livery Company, as they became, gave a certain status to a tradesman, and provided him with rights of franchise and of office, and support in times of hardship and old age. However, these advantages diminished as the rules for entry relaxed, and the City became a smaller part of the growing metropolis. Prior to the eighteenth century, the painter was very much a craftsman; he might be called upon to supply paintings on walls, as well as on panel and canvas. He may also have been expected to paint religious, civic, and military banners and heraldic shields. Equally, he would gild and paint architectural details, and with the increasing use of softwood in building, would need to apply a protective coating to preserve the different materials from the action of air and damp. The requirement to paint external softwood in order to protect it from the elements, and the appearance of deal on internal panelling led to an increased use of oil paint. Fashions, too, changed, and tapestry hangings and painted wall cloths tended to be used less in middle class houses. Painting gradually developed from being a craft practice into a mix of craft and trade. As the trade fragmented into its different branches, many aspects of the earlier system ceased to be of relevance. This, together with economic and social factors, and certain technical developments, led to the gradual decline in control of the trade by the Livery Company, and the consequent ending of the regulation of standards. 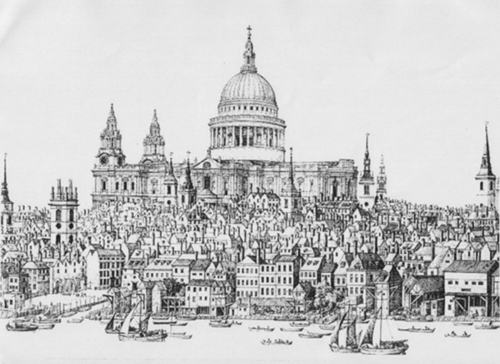 Eighteenth century London was an expanding city, which relied for its growth on a large number of immigrants from outside. At this time, about one in six Englishmen and women lived in the capital, or would do so at some stage in their lives. The apprenticeship system was set up by statute in the days of Elizabeth I. It allowed masters to take apprentices for a period of seven to eight years, and flourished in most of the major towns and cities of the country. Parents went to some lengths to arrange apprenticeship for their sons. They were required to find a suitable master, agree on the contract and pay the premium. Masters were limited in the number of apprentices that they could take. 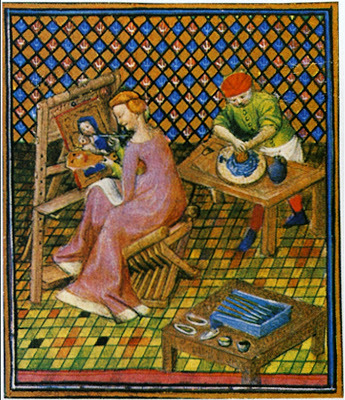 Apprenticeship typically began at the age of sixteen. Work conditions varied but the average day began at 7:00 A.M. and lasted until 9:00 P.M., with a break of two hours for a midday meal. During the winter months it would not have been possible to carry out much work on site after the late afternoon. Presumably the remainder of the day would have been spent in the more menial tasks as described below. During their seven years of training, they would not only be taught their master’s trade, but would assist on commissions. As they progressed, and became competent in the several branches of their “mystery”, they were entrusted with more specialised tasks, and may even have helped with the accounts and in direct dealing with the client. When his training was completed, the apprentice’s skills were tested by representatives of the Livery Company. Then, at three successive meetings, the apprentice was “called”, and if there were no objections to his election, he was sworn in as a member of the Company. 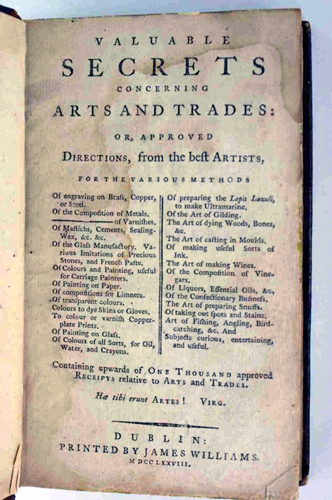 In many trades, seven years was merely a way of providing masters with cheap labour. The basics of most could be mastered in a few months, according to critics. On the other hand, serving an apprenticeship was the commonest way to become a full member of a Livery Company and acquire the freedom of the City of London, an essential part of an ambitious young man’s plans. 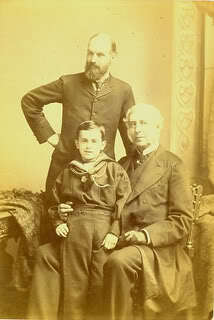 There can be little doubt that the apprenticeship system was of great benefit to the master, since his apprentice paid a substantial premium to enter his service, and his unpaid assistance might increase his master’s income even in the apprentice’s first year, and would certainly do so by the third or fourth year. Apprentices were not officially paid. However, towards the end of their training they were likely to be as skilled as many of the journeymen, and no doubt bargained with their masters to pay them wages; though the taking of wages technically barred them from becoming a freeman of the City of London, and therefore setting up on their own. The advantages to the apprentices were less obvious, especially for the majority who had no hope of ever becoming a master. Indeed, many such apprentices never bothered to take up their freedom, as can be seen by the very great difference between the numbers who became apprentices and the numbers who became freemen. We know very little of the background of all but the most well known former apprentices. 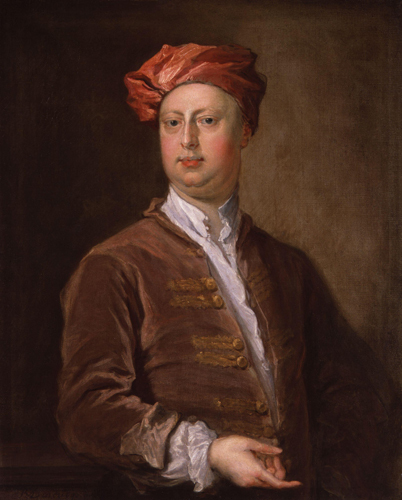 William Kent, the architect, was born the son of poor parents, and is said to have been apprenticed to a coach-painter in Hull before being sponsored to make a tour of Italy, where his early interest was solely in painting. Thomas Crace established a coach-making business in London, in the early years of the eighteenth century. In 1741, at the age of fifteen, his son Edward was apprenticed to an artist, a member of the Painter-Stainers’ Company, presumably because his talents lay in that direction. After serving his apprenticeship, he went on to found a firm of decorators that survived for 131 years, and that was to produce some of the best painted decoration of the nineteenth century. In the early years of his training, an apprentice was likely to be found carrying out the less pleasant, indeed more hazardous, tasks: the washing and preparation of pigments, the grinding of pigment with oil, and the cleaning of paint-encrusted kettles. The grinding of pigment by hand, to produce particles small enough to be thoroughly wetted by the oil medium, took a considerable amount of time. It was, according to a nineteenth century American painter; “not a highly-intellectual occupation, nor one calculated to lead the soul to longings after the ideal”. The painter working on the Earl of Leicester’s new house, at Holkham, was paid for 61 days work in “mixing and grinding colours”. 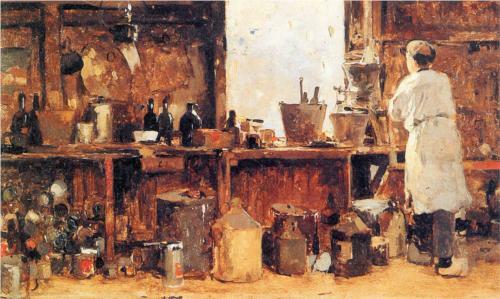 “This was the paint-shop. At one end was a fireplace…with an iron bar fixed across the blackened chimney for the purpose of suspending pails or pots over the fire… All round the walls of the shop – which had once been whitewashed, but were now covered with smears of paint of every colour where the men had “rubbed out” their brushes – were rows of shelves with kegs of paint upon them…Scattered about the stone floor were a number of dirty pails, either empty or containing stale whitewash…The lower parts of the walls were discoloured with moisture. The atmosphere was cold and damp and foul with the sickening odours of the poisonous materials. “When it was the Taste to paint Houses with Landskip Figures, and in Imitation of variegated Woods and Stone, then it was necessary to serve an Apprenticeship to the Business..but since the Mode has altered, and houses are only daubed with dead (i.e. flat) Colours, any Labourer may execute it as well as the most eminent Painter. With the declining influence of the Livery Company there was less incentive to complete an apprenticeship. The Company’s restriction on the training of one apprentice at a time severely limited the possibility for a master to expand and take on more business. At a time when every branch of industry required greater capital to run it, this had the effect of virtually eliminating the traditional prospect of progression from apprentice to journeyman to small master. 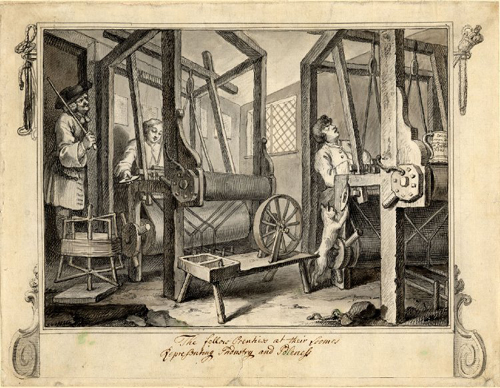 It must be said, however, that the success of the industrious apprentice could not be guaranteed just by hard work, as William Hogarth would have one believe in his series of influential prints called “Industry and Idleness”, of 1747. A certain amount of “studied sycophancy” and a calculated marriage would also be required to ensure success. I just came across that post and found it really interesting, even saved it to my Pocket accout! When will part two be published? Thanks. I’m holding back until my book is published. Probably next year. I will post part two when my book is finally published (2017). love this post, im a painter and decorator from australia and love reading history of the craft. Its a pitty now days that its all about the mighty dollar and big business profit. Alot of the workmanship i see around today is rushed crappy finishes with no pride taken. I cant wait until your book is published, hopefully i can get myself a copy in Australia. Thanks for the interest Jade. Yes. All too often I see signs of poor work, when for just a little more money a really good job could be done. As soon as the final details of the book are known I’ll publicise it. I’m working on the final edits now. 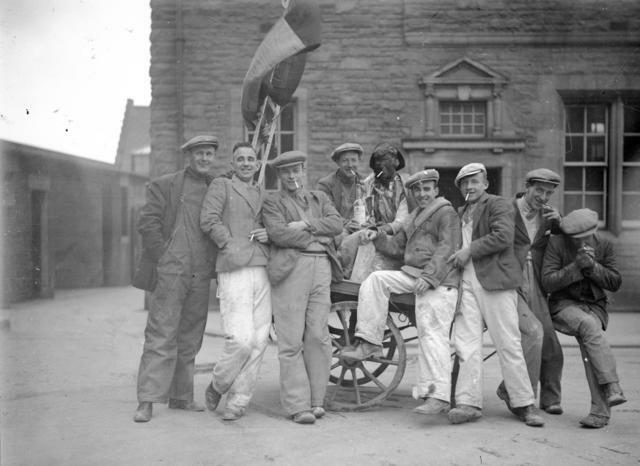 Your piece on housepainter history is superb! I’m researching my great-grandfather from Ireland, and his life as a house-painter. I started with only the name of his daughter as a guideline. I’ve discovered he was indeed, a painter by the time he arrived in Cincinnati, Ohio, USA and he may have been in an Irish guild. I linked your piece here to my own information…and thank you for your excellent research and work. Your other topics look equally as wonderful. Is there a book, you’ve written? Many thanks. Thank you Bonnie. I have a book coming out in June 2017 called ‘The Anatomy of Colour’ and published by Thames & Hudson.